Wisconsin Urban Wood (WUW), in partnership with the USDA Forest Service and the Lynden Sculpture Garden, will present the 2018 Urban Forest Fest 10 a.m. to 4 p.m. Saturday, September 15 at the Lynden Sculpture Garden in Milwaukee. The event is sponsored by the Wisconsin Economic Development Corporation (WEDC). Urban Forest Fest is an event to connect the public to the urban forest and its products. 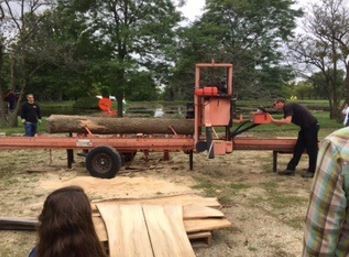 Many people forget that wood comes from trees; Urban Forest Fest will make the connection between neighborhood trees and the wood products people use on a daily basis by telling the tree-to-table story. 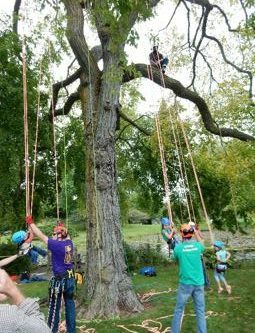 Planned activities and exhibits include the Wisconsin Arborist Association Kids’ Climb, a sawmill demonstration, WUW members’ wood products and services, WEDC and the USDA Forest Service, along with music and food. More than 500 people attended the 2016 Urban Forest Fest. View invitation to exhibit at the Fest. The Lynden Sculpture Garden is located at 2146 W. Brown Deer Road, Milwaukee. Wisconsin Urban Wood also is in the planning stages of an Urban Wood Symposium geared for architects and designers, as well as municipal professionals including city foresters, park directors, public works managers, etc. The one-day program will feature a key-note address by Jessica Simons, representative of the Michigan Urban Wood Network and Michigan state lead for the Urban Wood Network. The event is tentatively planned for Thursday, Nov. 8 in the Madison or Milwaukee area.